Ma and Pa Ingalls were my reference point for the American farmer – hardworking souls who got up at the crack of dawn to till the soil, plant crops and eventually harvest them for sale. Their lives – and livelihoods – depended on their work ethic, resourcefulness and Mother Nature. Farmers, at least in the show, could control their work ethic and ingenuity. But they couldn’t control nature. The amount of sunlight and water their crops received was out of their hands. They couldn’t protect their crops from diseases or freak weather events either. It almost seemed unfair. America’s hardest-working people had no control over their fate. As I grew older, I learned that farming had changed significantly from the days of Little House on the Prairie. Farming was big business now – not homesteaders going to the general store to buy seed and plows on credit. Massive machines had replaced horse-drawn plows. Farms were sophisticated operations yielding more grain and produce than they ever had before. Intellectually, I knew farms were big businesses that were always trying to be more efficient. But emotionally, I still clung to the notion that farming was as simple as planting things and then picking the yield from the ground (or trees) to sell to customers – and that farmers had little control over what they produced. Even my first college roommate couldn’t convince me otherwise. Wally was a senior studying turf management at Michigan State University. I had never even heard of turf management at the time. So the very existence of this major blew my mind. Wally wanted to run golf courses (another career option I didn’t know existed). So he was studying how to grow, tend to and repair different types of grass. There is a fair amount of science involved in the process. So I should have realized there is a lot more to farming than planting and harvesting, but for some reason the lightbulb never clicked. It wasn’t until last week that I finally accepted there’s a lot more to farming – and agriculture – than meets the eye. What happened last week? The Cannabis Science Conference. I spent the bulk of my time in the conference’s cultivation track. And it was an eye-opening experience. When we talk about marijuana, we spend so much time focused on THC, CBD, terpenes, medical marijuana potential, regulations, legalization, taxation, compliance, edibles, vapes and so much more that we forget cannabis is fundamentally an agricultural product. It all starts with the plant. The amount of science that goes into growing the plant is incredible. Sensors measure everything from leaf temperature to humidity, airflow and light intensity. The microbes in the soil are closely analyzed. Blue light is shined on the plant toward the end of the grow cycle to increase terpene levels. Professional grow operators try to measure and control every variable that can affect the marijuana plant. They leave nothing to chance. The science behind growing marijuana is relatively new. Because pot is illegal at the federal level, researchers haven’t been able to effectively study it until recently. The effects of this lack of research are more profoundly felt on the medical side of the industry. Just imagine the millions of lives that could be helped if medical marijuana treatments for pain, epilepsy, Parkinson’s disease and other ailments were widely tested and available right now. 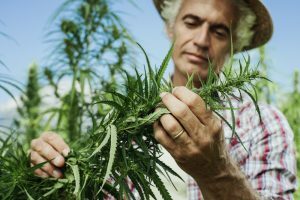 The marijuana research gap affects the cultivation of marijuana as well. Growers are still experimenting and learning the best way to grow the plant – and the best way to create plants with different mixes of THC, CBD and terpene levels. And they’re using other plants to get some help. For example, you might already know marijuana is a “high light” plant. It needs high levels of light to grow. In that respect, marijuana plants are similar to tomatoes. Since tomatoes and marijuana share some of the same growing characteristics, the extensive research done on growing tomatoes could ultimately help the marijuana industry. Hearing that at the Cannabis Science Conference was my aha! moment. For the first time, I truly understood. There’s nothing warm and fuzzy about growing plants, vegetables and produce anymore. Growing crops is as data-driven as building and manufacturing cars or managing supply chains. Big data already shapes industry, agriculture, sports and even stock trading in ways we don’t think about or necessarily appreciate today. And big data is about to take over the cannabis industry. That’s a good thing. But I kind of wish I still believed that people planted things… those things grew… and then they got harvested. It’s a simpler way to view the world. And I’m going to miss it. The post Big Data Drives Agriculture, and It’ll Drive the Cannabis Industry Too appeared first on Early Investing.